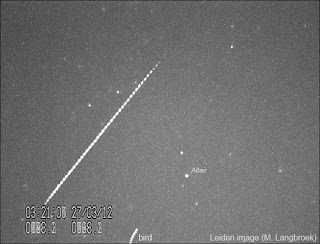 A beautiful, slow, long duration, fragmenting fireball was filmed from Brazil in the evening of April 20 (20 April near 20-21h UT). Movies can be seen here and here. Soon after the apparition, the question came up: meteoric fireball, or a reentry of "space junk"? Based on the visuals of the two movies available, I noted that it looked like a meteoric fireball, not a reentry. Subsequently, a piece appeared in Universe Today, claiming it was a reentry: that of an Atlas Centaur rocket, #16102, 85-087B, which launched Intelsat 512 in 1985. That conclusion is simply wrong however. According to USSTRATCOM the object in question decayed 18.5 hours earlier than the fireball, over the western Pacific at 1:23 UTC (20 April) near 18N, 161 E. It reentered nowhere near Brazil. 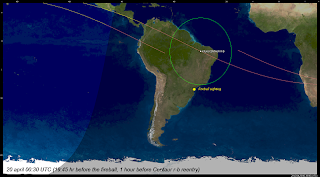 It did pass over northern Brasil on its final pass an hour before reentry, but that would have been at 00:30 UTC, not 20-21 UTC. Moreover, even that pass would have been too much north to see it from the southern Brasilian location where it was filmed from: it would have passed below the horizon as seen from there. And even if pieces would have survived longer (highly unlikely in this case), these could not have caused a fireball over Brasil 18.5 hours later: the orbital plane of the r/b was wrongly oriented for that. Around the time of the fireball, any surviving objects in the Centaur orbit would not pass over Brasil but much more north, over Mexico and the Caribean (see below. Note: the object was no longer in orbit at that time!). 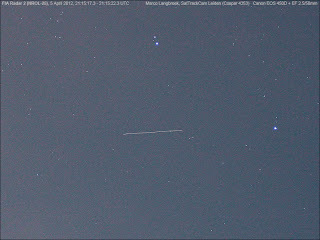 So, the object that was filmed was most likely a piece of asteroidal debris, a very nice, very slow and very long duration meteor grazing through the upper atmosphere and breaking to pieces. 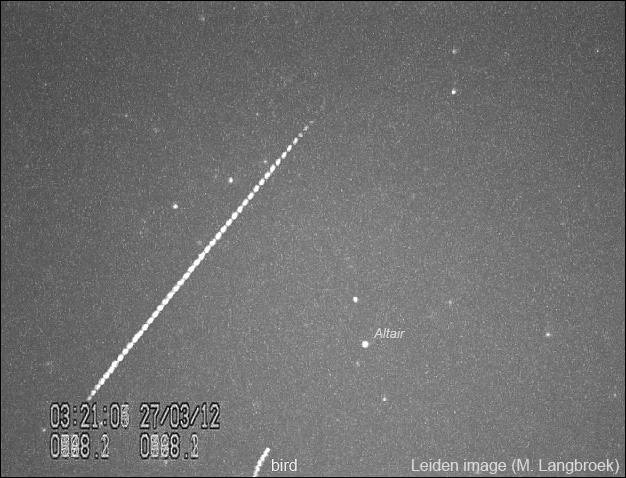 In the early morning of March 27, while waiting for a pass of ATV-3, I accidentally filmed a nice meteor from Leiden. 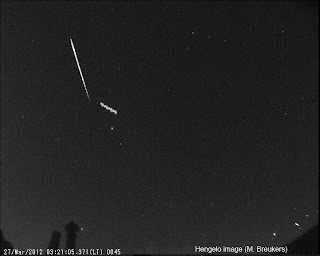 As it turned out, the same meteor was also filmed by the meteor surveillance video of Martin Breukers in Hengelo. Hence, we have this approximately mag. 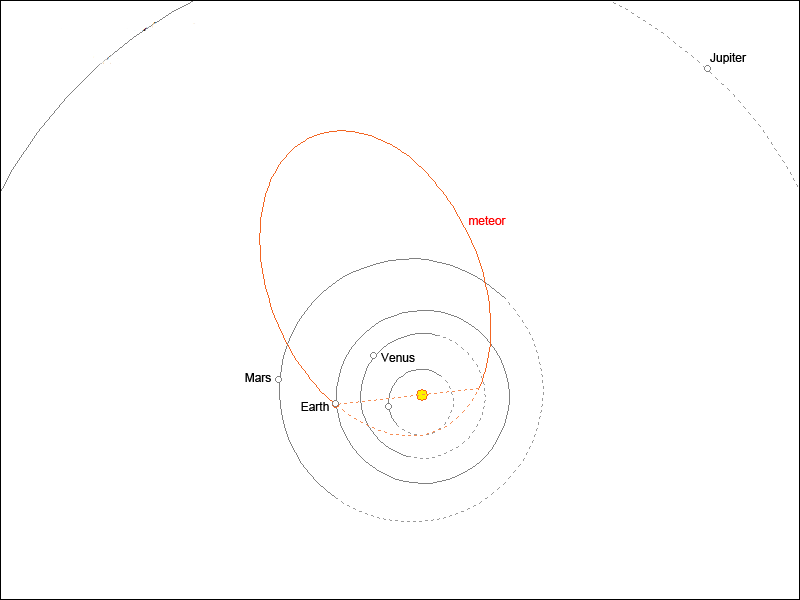 -1.3 meteor multistation, allowing triangulation to determine the 3-dimensional atmospheric trajectory and orbit in the solar system. Martin used UFOanalyzer software to process the images and arrive at an atmospheric trajectory. 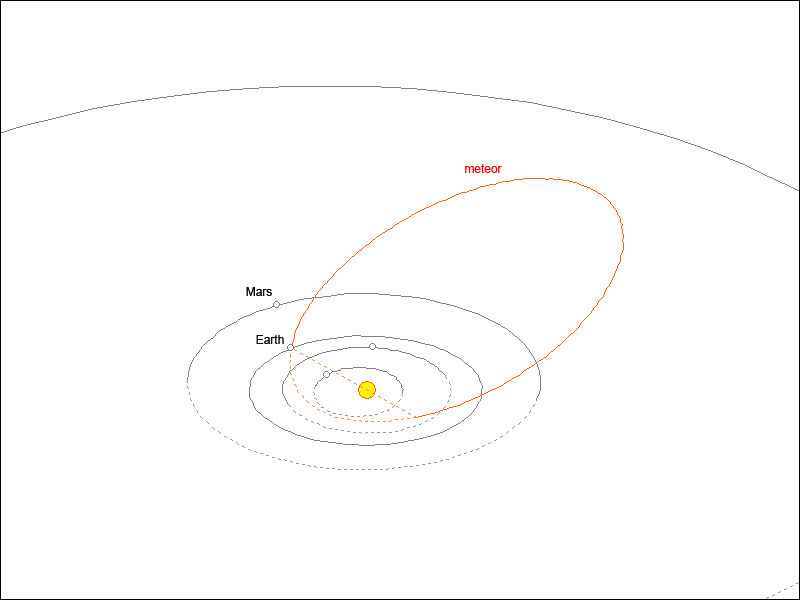 I used my orbital spreadsheet Metorb85 to compute a heliocentric orbit for the meteor. 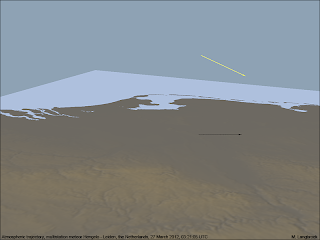 The movie above shows the meteor footage as obtained from Leiden and Hengelo, plus a 360-degree fly-by around the reconstructed atmospheric trajectory. 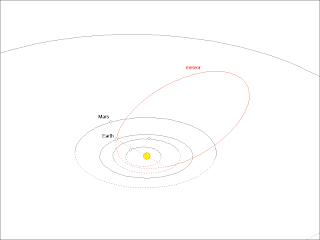 The meteor started at 51.745 N, 6.267 E, at 100.4 km altitude. It ended at 51.961 N, 6.707 E and 75.2 km altitude. It had an initial velocity of 27.8 km/s. The geocentric radiant was near RA 198.20 deg, dec. +4.01 deg, Vgeo 25.67 km/s. The radiant position has some leeway due to the low convergence angle. Hengelo saw the meteor appear in Corona Borealis: Leiden in the Aquila-Sagitta-Delphinus border area. When NASA's experimental solar sail Nanosail-D was launched by a Minotaur IV rocket in 2010, it was not the only object this launch brought into space. A number of other, classified objects were part of the same launch. 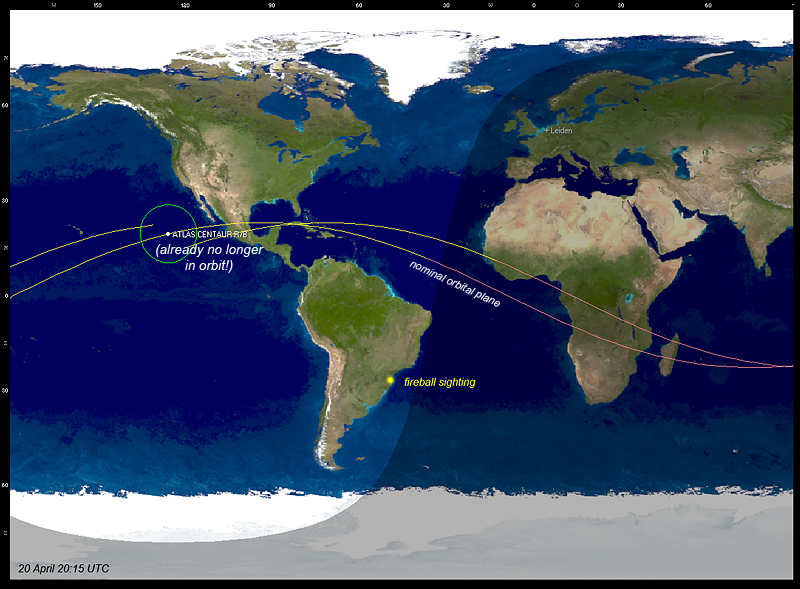 Now Nanosail-D has decayed, four of these objects (RAX, OREOS, FASTSAT, FAST 1) are being tracked by amateur trackers. One additional object of the launch that is being tracked, however cannot be identified reliably with one of the payloads so far. It could be a payload, or a rocket part from the launch. Dubbed the 2010-062 UNID (10-062X) or "Nanosail UNID" by amateur trackers, it is an object near magnitude 4-5, stable in brightness. 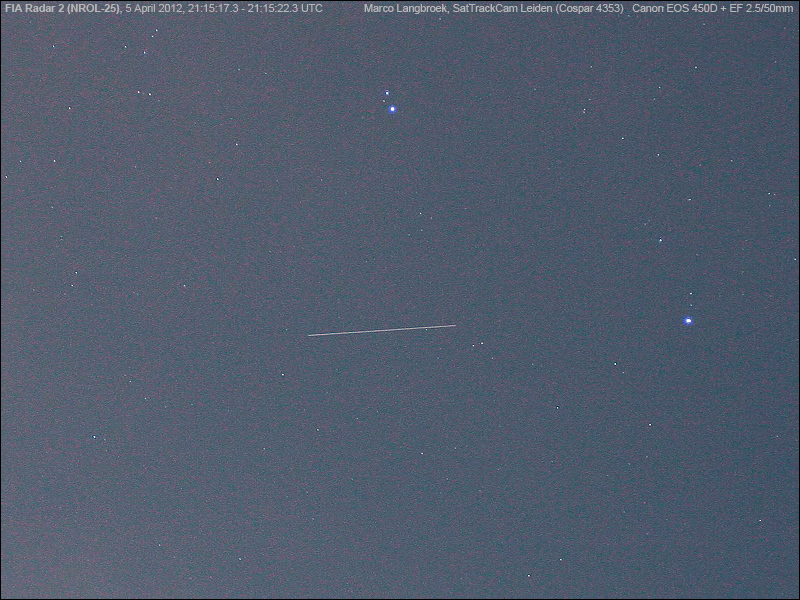 The footage above (WATEC 902H + Canon EF 2.0/35mm lens) shows it passing through the tail of Uma (bright stars are epsilon Uma and delta Uma) on April 1st 2012. I also filmed Lacrosse 5 (05-016A) that evening. 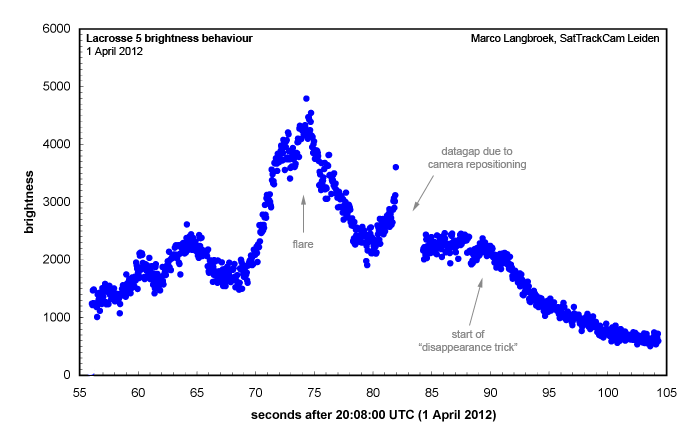 The erratic brightness behaviour of this satellite has featured before on this observing blog. Using footage from the April 1st pass and LiMovie, I reconstructed the brightness curve below, showing a flare at 20:09:14 UTC and a general quite irregular brightness behaviour with what looks like several small peaks. At 20:09:30 UTC, it appears to do it's typical "disappearance trick" again, dropping rapidly in brightness in just a few seconds of time (note: shadow entry was not before 20:12:00 UTC). 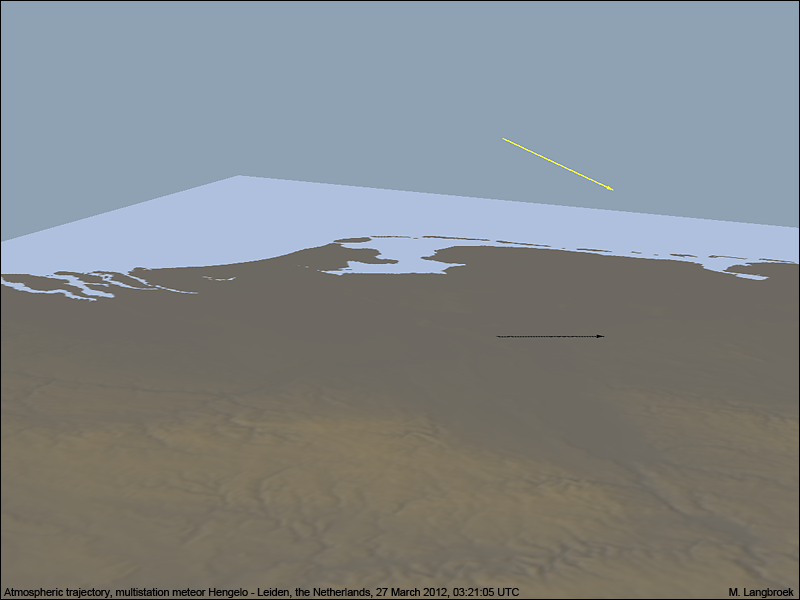 The profile is very similar to profiles for Lacrosse 5 which Philip Masding previously obtained, also showing the "disappearing trick" being preceeded by a flare. More objects were observed the past few nights. Among them USA 129 (96-072A) and Lacrosse 4, while CCD imagery of Prowler (90-097E) using the "remote" Rigel telescope of Winer observatory was obtained again as well.